Posted by M Bharath Bhushan in Art, English, Identity, Personalities, Telangana. Apart from being India’s most famous sculptor, G. Ravinder Reddy is also arguably, one of the country’s most modest artists. When asked how he feels about one of his works being sold for Rs 1.41 crore at a recent auction at Christies, he replies, “Really… it sold for so much. I had no idea. My job is to work on the sculptures, selling them is not my domain.” He seems content with the knowledge that people appreciate his work. He also has no idea who his buyers are. 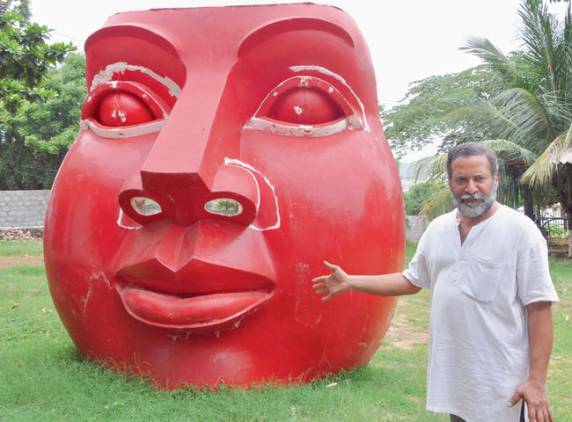 Famous for making gigantic female heads and life size sculptures of women, Reddy has become the toast of the art world as his works are making headlines everywhere. Apart from the recent auction, his current collection Tara, on display in Paris as part of a French and Indian Arts display at the Centre Pompidou, has been getting him great reviews. But success hasn’t affected him at all as Reddy doesn’t even give importance to the fact that he has now firmly cemented his position as Andhra’s most famous artist. “I can’t claim that I am AP’s leading artist. I am just doing my little bit,” he says. Posted by M Bharath Bhushan in 1969, agitation, Andhra, Culture, elections, Identity, JAC, Kakatiya, KCR, Mulki, Personalities, politics, regionalism, Sonia, students, Telangana, TRS, universities. 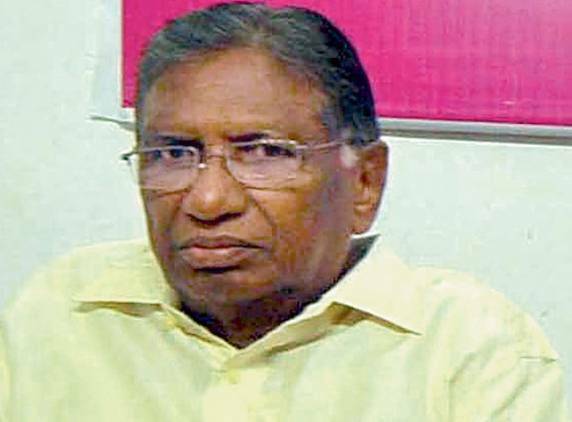 Telangana ideologue Prof K. Jayashankar, a former vice-chancellor, passed away on Tuesday morning at his residence in Hanamkonda after battling liver cancer for over a year. He was 76. Throughout the day, hundreds of people visited VSM Nilayam at Advocates’ Colony in Hanamkonda, where Prof. Jayashankar was residing at Flat 401, and Ekashila Park where the body was kept in state for mourners to pay their respects. He had been diagnosed with cancer on June 27 last year at Hyderabad’s Institute of Gastroenterology and was undergoing chemotherapy. A bachelor, he had adopted a boy. A Ph.D in economics from Osmania, the professor was vice-chancellor of KU from 1991-94 and registrar of Central Institute of English and Foreign Languages from 1982-91. The solemn occasion turned ugly when senior Congress and TD leaders, who had come to pay their respects, were attacked and chased away by activists of TRS and the Kakatiya University Joint Action Committee. Telangana ideologue Prof Kothapalli Jayashankar, who passed away on Tuesday, had one last wish: A separate Telangana state. Posted by M Bharath Bhushan in agitation, Andhra, Andhrapreneurship, Bhadrachalam, Congress, displacement, Godavari, heritage, Koya, Polavaram, politics, ST, Telangana, YSR. HYDERABAD: Environment and Forest Minister Jairam Ramesh said the clearance for Polavaram project will not be possible till the Andhra Pradesh government ensures that villages in Chhattisgarh and Orissa are not submerged. “There has been no significant shift since the last position. Orissa and Chhattisgarh are objecting as they fear Dantewada and Malkangiri will be submerged as a result of the project. The Andhra Pradesh government has proposed Rs 620 crore embankment wall to be constructed in these states. A final decision has to be taken on that matter by the Chhattisgarh and Orissa governments,” he said. Posted by M Bharath Bhushan in agitation, Identity, JAC, Kakatiya, KCR, regionalism, struggle, Telangana, TRS, universities. Hyderabad: Telangana region was enveloped in a gloom and mourning as one of the oldest ideologues and visionaries of Telangana state Prof Kothapally Jayashankar passed away on Tuesday. The 76-year-old professor, who was suffering from cancer and was undergoing treatment at a hospital in Hyderabad, breathed his last at his home in Hanmakonda in Warangal district where he was shifted earlier. A leading light of all the movements for Telangana state during last half a century, Jayashankar also served as a the vice chancellor of the Kakatiya university in Warangal. Jayashankar who made his last public appearance at the launch of a pro Telangana Telugu daily “Namaste Telangana” in Hyderabad last month, always held the dream of separate state very close to his heart as he believed that the region was not getting justice from Andhra region. Posted by M Bharath Bhushan in 1969, agitation, Andhra, compromise, Congress, CPI, Culture, drama, Hyderabad, Identity, JAC, KCR, Mulki, politics, regionalism, Review, Settler, Telangana, TRS, universities. The most dreaded ‘T’ word is back in Andhra Pradesh politics. After a long lull, the movement for Telangana state is once again picking up steam. Posted by M Bharath Bhushan in agitation, Culture, Economy, Hyderabad, Identity, Karimnagar, livelihoods, Mahabubnagar, Medak, Mulki, Palamur, politics, regionalism, Review, Telangana. Medak, a district that borders Greater Hyderabad, is a telling example of the poor economic development in Telangana, writes Kingshuk Nag in ‘Battleground Telangana: Chronicle of an agitation’ (www.harpercollins.co.in). Posted by M Bharath Bhushan in agitation, bandh, Congress, drama, elections, Identity, JAC, KCR, Mulki, politics, regionalism, TDP, Telangana, TRS. 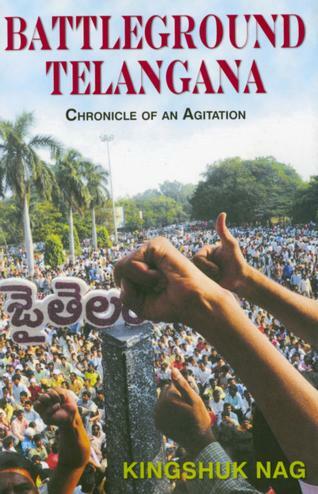 June 4: The Telangana Joint Action Committee has decided to go on a major offensive for their quest for a separate state. The Committee has threatened another Million March and bandhs starting June 10 to force the UPA government to take an early decision to bifurcate the state. Posted by M Bharath Bhushan in Andhra, Culture, Identity, movement, Mulki, politics, regionalism, Telugu. Posted by M Bharath Bhushan in Andhra, BJP, compromise, Congress, Culture, elections, Identity, Karimnagar, Mulki, politics, suicide, TDP, Telangana, Telugu, TRS. The Telangana Poru public meet organised by the BJP at Dr B.R. Ambedkar Stadium here on Tuesday proved a grand success as the attendance exceeded the expectations of the party leaders. While privately BJP leaders had said they expect 25,000- 30,000 people, the number of people who attended the meeting is estimated at more than 50,000 with thousands of people who could not enter the stadium lingered outside it. Posted by M Bharath Bhushan in Congress, elections, Identity, Mulki, Osmania, politics, regionalism, Sonia, students, Telangana. The state endowments minister, Mr Jupally Krishna Rao, became the first minister on Tuesday to resign from Mr Kiran Kumar Reddy’s Cabinet citing the Telangana issue. Deviating from established norms, Mr Krishna Rao met the Governor, Mr E.S.L. Narasimhan, on Tuesday evening and submitted his resignation instead of giving it to the Chief Minister. Mr Krishna Rao’s resignation will most probably be accepted once the Governor receives a formal recommendation from the Chief Minister. This is the second incident of a minister directly submitting a resignation to the governor. A year back Ms Konda Surekha had submitted her resignation from Mr K. Rosaiah’s Cabinet to the Governor.